Tim Lucas / Video WatchBlog: Sentimental, Isn't It? 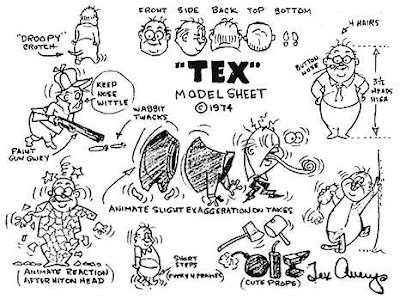 According to the sternest and most task-mastering schoolmarm I ever had, the IMDb, Frederick Bean "Tex" Avery -- indisputably the greatest gag animator of all time -- was born 100 years ago today in Taylor, Texas. This is a centenary that catches me unaware but really cannot be ignored, so this posting will be more of a valentine than a full-length essay. I almost missed the train on this one, as the hipster protagonist of his classic MGM cartoon "Symphony in Slang" might have said in my position. The problem of paying proper tribute to Avery is really kind of hairy; it's eating away at me. I don't know whether I'm coming or going. I don't want to do a snow job on him or anything, but he was the tops to me, so I'm bent... on running off at the mouth with some good vibes. How does one say "thank you" to the man who gave us the first recognizable Bugs Bunny cartoon, Daffy Duck, Droopy, Screwy (née Screwball) Squirrel, Red Riding Hood, the Big Bad Wolf, the Three Little Pups (is there any one among us who didn't try watching television with their eyes crossed and tongue thrust out the corner of our mouths after making their august acquaintence? ), Spike, Egghead, Meathead, Willoughby, and the immortal Owl Jolson? I suppose all the thanks he would have wanted is our continued love (especially from fans of the female persuasion) and laughter, which we give effortlessly when faced with the likes of "King-Sized Canary", "Ventriloquist Cat", "Northwest Hounded Police", "Uncle Tom's Cabana", "Magical Maestro" (if thy hair in the gate offend thee, pluck it out), "Slap Happy Lion", "Senor Droopy" (with a cameo by the original Lina Romay) and "The Legend of Rockabye Point" -- the flat-out funniest body of work to be found in the annals of animation. The bear has just come out of his cave again to club my head and demand "Quiet," so I've got to make my summation quick. In a still-young 21st century where Charlie Chaplin is largely considered a museum piece, where W.C. Fields and Fred Allen and Jack Benny are barely remembered, where the name of Preston Sturges is known only to an elite core group of film buffs, where the Three Stooges are generally viewed with disdain by an entire gender, and where Jerry Lewis is appreciated mostly by the French, Tex Avery's brand of humor remains astonishingly fresh (in all senses of that word), direct, relevant, up-to-date and universal, so he would seem to stand a better chance at immortality than most of his 20th century contemporaries in fundom. I can say no more... because the cat has my tongue.